PDM is a server based application and files are cached locally when they are accessed in PDM via Windows File Explorer. Files cache can be cleared or outdated. That means that desktop applications may fail when trying to access the file in PDM vault if it has not been cached locally. File Not Found error will occur. 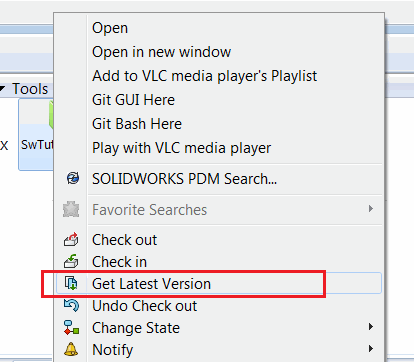 To increase the performance this macro utilizes the IEdmBatchGet SOLIDWORKS PDM API interface which enables batch files processing. Uncomment the GetLocalCopyFromVault and run macro again. Now the model is successfully opened as the file has been cached locally. Const FILE_PATH As String = "FULL PATH TO FILE"
GetLocalCopyFromVault FILE_PATH, "VAULT NAME", "USER NAME", "PASSWORD"
MsgBox "Failed to login to vault"